The first production sports car made in the USA. This first year of Corvette production also created the rarest model with only 300 cars being manufactured as 1953 Corvettes. General Motors chief design engineer and stylist, Harley Earl is referred to as the “Father of the Corvette” for convincing GM to build this new sports car. Harley Earl was General Motors premiere design engineer and the head of GM’s Design and Styling Department from 1927 to 1958. After World War II he noticed the growth of the European sports car market and then after attending an auto race at the Watkins Glen race track, in upstate New York, he became impressed with the performance of small European Sports cars. This inspired Harley Earl to develop an American sports car, so he initiated the design concept in 1951 and helped GM to develop a sports car by 1953. The special project to build the first American sports car was initially referred to as the “Opel Sports Car.” The name Corvette was later suggested, which is the name of a small and fast Navy battleship. The name Corvair was also considered but Harley Earl eventually decided to use the name Corvette. Harley Earl also proceeded to work with Ed Cole, the Chief Engineer at Chevrolet to develop a concept car and GM approved the development of a prototype for the GM Motorama auto show. The production of the first assembly line Corvette was completed on June 30, 1953 and the Corvette was created as the first production sports car made in America. The Corvette is also the first production car manufactured with a light weight Fiberglass body. “Blue Flame Special” six-cylinder that produced 150 horsepower at 4500 rpm. The Blue Flame Special six-cylinder was equipped with triple side draft Carter “YH” carburetors, solid lifter camshaft and 8.0:1 compression ratio. The production numbers for the 1954 Corvette went up to 3,640 cars and Corvette assembly line manufacturing moved to a new GM production facility in St. Louis Missouri. The 1954 model received a new camshaft that increased power to 155 hp. The Blue Flame Special six-cylinder was equipped with triple side draft Carter “YH” carburetors, solid lifter camshaft and 8.0:1 compression ratio. The first small block Chevy V8 engine for Corvette was introduced in 1955. This 265 cid V8 engine had power rated at 195 hp @ 5000 rpm and weighed 30 pounds less than the Blue Flame six. Production for 1955 was 674 Corvettes with only six cars built with the six- cylinder engine and 668 with the V8. This was the last year for the Blue Flame six-cylinder Corvette engine. Corvette performance increased in 1956 with the base 265 V8 engine producing 210 hp. The dual 4 barrel carbureted engine was rated at 225 hp and the highest performance 265 cid V8 was rated at 240 hp with dual 4 barrel carburetors and a special camshaft. A 1956 Corvette could produce 0-60 mph performance in 8.9 seconds and a top speed of 129 mph. Performance improved in 1957 when the displacement of the Corvette engine increased to 283 cid and an optional fuel injection engine was also offered. The base V8 engine produced 220 hp with a single 4-barrel carburetor and 245 hp with dual four barrel carburetors. (283 cid – 283 hp). 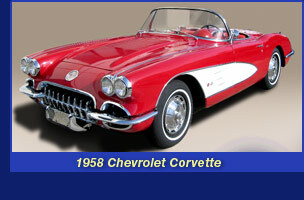 Corvette models produced in 1958 and 1959 have base 283 cid engines rated at 230 hp. Dual 4 barrel engines produced 250 hp and dual 4-barrel engines with high lift Duntov cam produced 270 hp. The Ramjet Fuel Injected engine with the high lift Duntov cam is rated at 290 hp at 6200 rpm. Corvettes produced in 1960 and 1961 maintained the base 283 cid engine with 230 hp @ 4800 rpm. The RPO 468 engine with dual 4 barrel carburetors produced 270 hp. A new engine option with solid lifter camshaft and 11.0:1 compression ratio increases power to 315 hp at 6200 rpm with the Ramjet Fuel Injection. The 1962 Corvette was the last year for the 1st generation body style. Performance increased for the 1962 Corvette when Chevrolet bored and stroked the small block Chevy to produce the 327 cid engine. Power output ranged from 250 hp for the base carbureted engine to 360 hp for the fuel-injected engine. The 1962 Corvette delivered serious performance with the 360 horsepower fuel injected engine producing 0-60 mph in 5.9 seconds and running the quarter mile in 13.8 seconds.